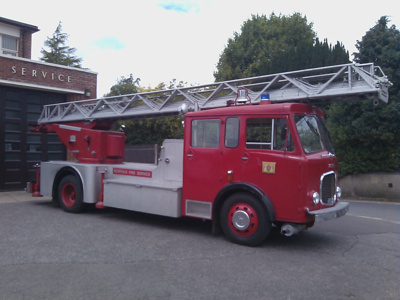 Norfolk Fire Museum's aim is to preserve, maintain and display fire appliances, equipment, uniform and other memorabilia related to the history of fire fighting within the county of Norfolk, UK. Details of what we have are gradually being added to the catalogue and will be available to view here. We have a collection of 3 ex. Norfolk vehicles and 3 trailer pumps (all under renovation), covering the period from the 1940s to 1970s. The museum also has use of a 1962 Dennis F27 TL (pictured) and 1996 Mercedes 1124 fire appliance which are maintained by NF&RS. Plus there are other ex. Norfolk vehicles and pumps in private ownership, housed by the museum. Older items include an 8-man manual pump and other small hand pumps from various 'works' brigades. A ladder trolley, extinguishers, helmets, uniform and even a switchboard/turnout panel from one of the old control rooms. There are many log books, photographs, documents and other periodicals, some of which detail exactly what events were happening on a day by day basis. There are also other museums within Norfolk which house fire related artefacts and we are keen to support and work with these too. Chairman --------------------------------Chief Fire Officer NF&RS Secretary-------------------------------------------------Volunteer Treasurer & Fundraising---------------------------------Volunteer Curator & Archivist---------------------------------------Volunteer Vehicles maintenance & Events-------------------------Volunteer All the hard work------------------------------All our volunteers !